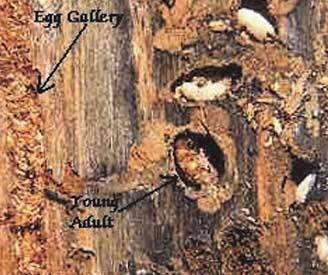 Mountain pine beetles affect pine trees by laying eggs under the bark. The beetles introduce blue stain fungus into the sapwood that prevents the tree from repelling and killing the attacking beetles with tree pitch flow. The fungus also blocks water and nutrient transport within the tree. On the tree exterior, this results in popcorn-shaped masses of resin, called “pitch tubes”, where the beetles have entered. The joint action of larval feeding and fungal colonization kills the host tree within a few weeks of successful attack (the fungus and feeding by the larvae girdles the tree, cutting off the flow of water and nutrients). Originally called Black Hills or Rocky Mountain Pine beetle. 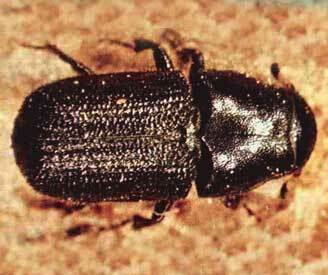 Beetle that feeds on bark; one generation per year. Cylindrical, black adults; the head is obvious from above. About 4-7.5 mm long, indented along the elytra. Larvae are white with a sclerotized head. Mainly lodgepole and ponderosa pine, but attacks many other pine species. Native to the forests of North America. Spreads through the movement of firewood or other wood products with bark still on the wood. When the tree is first attacked, it remains green. Usually within a year of attack, the needles will have turned red. This means the tree is dying or dead, and the beetles have moved to another tree. In three to four years after the attack, very little foliage is left, so the trees appear grey. As beetle populations increase or more trees become stressed because of drought or other causes, the population may quickly increase and spread. 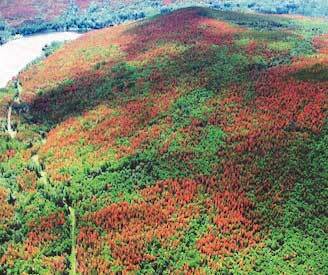 Healthy trees are then attacked, and huge areas of mature pine stands may be threatened or killed. Warm summers and mild winters play a role in both insect survival and the continuation and intensification of an outbreak. Adverse weather conditions (such as winter lows of -40°) can reduce the beetle populations and slow the spread, but the insects can recover quickly and resume their attack on otherwise healthy forests. Found in Northwest counties of Nebraska, especially in the Wildcat Hills and the Pine Ridge areas.